Walt Disney Animation Studios and Emmy®-winning director Rich Moore (TV’s “The Simpsons,” “Futurama”) take moviegoers on a hilarious, video-game-hopping journey in “Wreck-It Ralph,” the story of an arcade game Bad Guy determined to prove he can be a Good Guy. 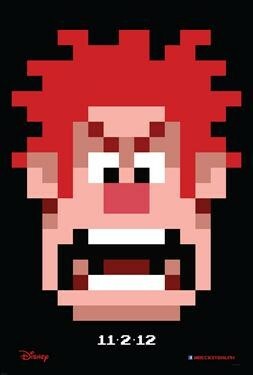 Wreck-It Ralph (voice of John C. Reilly) longs to be as beloved as his game’s perfect Good Guy, Fix-It Felix (voice of Jack McBrayer). Problem is, nobody loves a Bad Guy. But they do love heroes… so when a modern, first-person shooter game arrives featuring tough-as-nails Sergeant Calhoun (voice of Jane Lynch), Ralph sees it as his ticket to heroism and happiness. He sneaks into the game with a simple plan—win a medal—but soon wrecks everything, and accidently unleashes a deadly enemy that threatens every game in the arcade. Ralph’s only hope? Vanellope von Schweetz (voice of Sarah Silverman), a young troublemaking “glitch” from a candy-coated cart racing game who might just be the one to teach Ralph what it means to be a Good Guy. But will he realize he is good enough to become a hero before it’s “Game Over” for the entire arcade? “Wreck-It Ralph,” an action-packed, visually stunning CG comedy set in contrasting worlds that are like nothing ever before seen on the big screen, is produced by Clark Spencer (“Lilo & Stitch,” “Bolt”). Taking fun and games to a whole new level.